At BlindSaver, online at BlindSaver.com, you'll find a huge source of window blinds,shades, and shutters. Among the options offered at BlindSaver are mini blinds, wood blinds, cellular shades, roller shades, pleated shades, vertical blinds. BlindSaver allows you to shop for your products by feature or even brand. The top brands that BlindSaver has for you include Bali, Collegiate Shades, Comfortex, Graber, Levolor, and M&B. So be sure to checkout all the blinds, shades, and shutters that BlindSaver has to offer you. But first, stop by RetailSteal for the best BlindSaver coupon codes, BlindSaver promotions, and BlindSaver discounts. BlindSaver offers free ground shipping via UPS or Fedex on almost all shipping. For oversized orders additional freight charges are included. International shipping is not available. See website for full details, exclusions may apply. 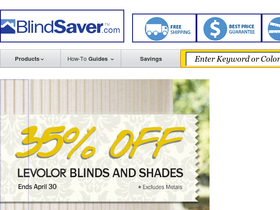 Use this coupon code on BlindSaver to save 40% on Bali Blinds. Click to save. Hurry in to save 30% on the complete Levolor line at Blindsaver. Click to save. Head over to BlindSaver today and save up to 85% on custom blinds and shades. Save $25 on your order of $500 or more from BlindSaver with this coupon code. Click link to save. Shop Blindsaver.com and save $20 on window coverings with this coupon code. Must purchase $349+ to qualify. Use our coupon code at BlindSaver to receive a $20 discount on your purchase of $349 or more. Click the link to start shopping today. Use this coupon code on BlindSaver to save $75 on orders of $1500 or more. Click to save. Use this coupon code on BlindSaver to save $100 on orders of $2000 or more. Click to save. Enjoy a $150 discount on your purchase of $3000 or more when you enter our coupon code at checkout at BlindSaver online. Spend $200 or more on your order at BlindSaver and use this coupon code at checkout to receive $10 savings. At BlindSaver receive free shipping on most orders that are not oversized. Click link to start saving.